Once the home of Denver’s municipal airport, Stapleton has transformed the area into a master-planned, mixed-use neighborhood with a long list of impressive amenities and features. Stapleton is bounded by Interstate 70, Montview, Havana and Quebec, and sits in close proximity to Downtown Denver, making commuting easy. Boasting an abundance of trails, picturesque parks and open space, this unique urban community is a great choice for business professionals, families, empty nesters, retirees and everyone in between. Homes for sale in Stapleton include a wide variety of properties with varying styles and sizes. 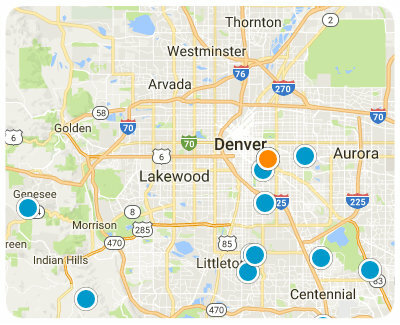 In Stapleton you can find detached single-family homes, lofts, townhouses, and mini-mansions, all within a relatively broad price range. All the homes here are fairly new as the development didn’t break ground until the late 1990s. Resale homes are plentiful, however there are also a wide variety of builders offering new construction opportunities. Yards here tend to be slightly smaller than other suburban communities, but recreation centers and parks are abundant and nearby. Stapleton is a great place to buy a home because of its urban fusion. With homes mixed in with restaurants, shopping and entertainment venues, commercial buildings and needed services, Stapleton affords its residents a life of unmatched convenience. Families will be delighted to find the public schools here are also new and excellent. Nearby schools include magnets like the Denver School of Science and Technology and the Denver School of Arts, as well as private school options like Machebeuf Catholic School and The Stanley British Primary School. Located within Denver, the city and county, this community is a perfect place for those wanting contemporary homes at an affordable price, and a suburban lifestyle while living in the city. For more information regarding the homes for sale in the Stapleton neighborhood of Denver, Colorado, please do not hesitate to contact us today.